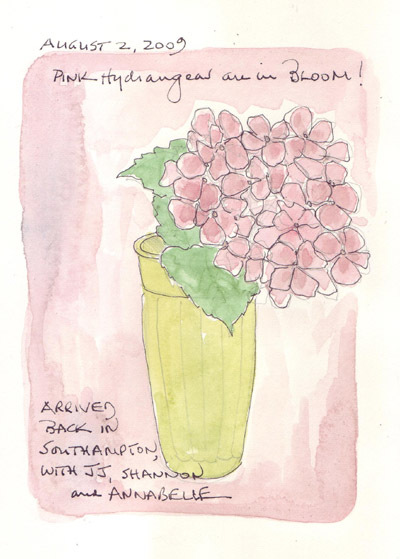 We just spent several days in Southampton with our youngest grandchild, Annabelle. Our other 4 grandchildren live in Manhattan and spend lots of time with us. Annabelle needs to figure out who we are and reestablish trust with each visit. These are the first 3 journal pages from our visit. When we arrived the pink hydrangeas at the house were finally in bloom and we brought one flower in to brighten an otherwise rainy Sunday. This is Annabelle, on arrival in Southampton, sitting so nicely next to the pink hydrangea. The circle to the left of the picture is one of the bubbles being blown as she plays with her cousins. 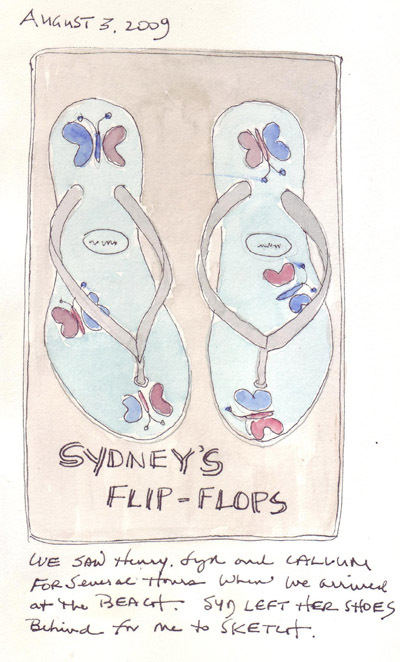 The following day Annabelle played with her cousin Sydney's flip-flops and I decided that these may be the only butterflies that I would see all week. So this is my entry for EDM Challenge #235 - Draw a butterfly. We had beautiful sunny days and after a morning walk on the neach with Annabelle, we took her to the village park and children's playground. Wen we arrived these 4 "friends" were clustered together on the dock and I was able to rapidly sketch them before they swam off. 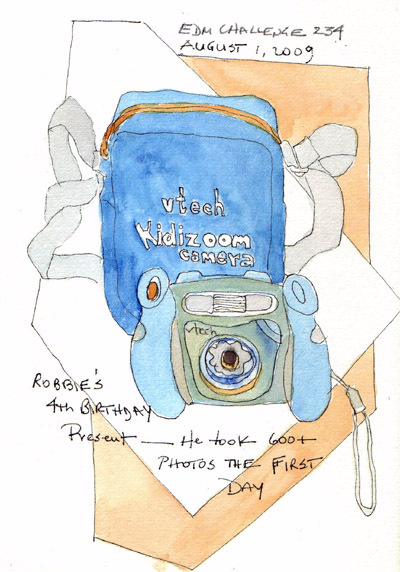 We gave one of our grandchildren the Vtech Kidizoom camera last week for his 4th Birthday. It is a robust point-and-shoot digital camera made for children and he took 600+ photos during the first 24 hours! I set up a folder for him on my computer and we saved a few of the first pictures. Now I need to decide how I can take our 4 oldest grandchildren on a "photoshoot" in Central Park with their children's digital cameras. 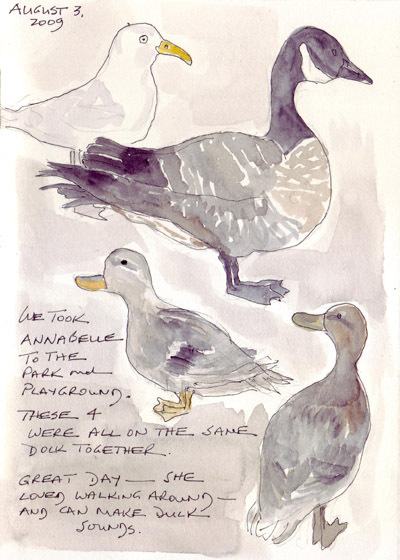 We made our annual visit to see friends near Kenne, NH last week and here are two daily sketches. The family has two yellow labs that accompany them to the lake house each summer, and even though I have lots of photos of the dogs, this is the first time that I sketched them. 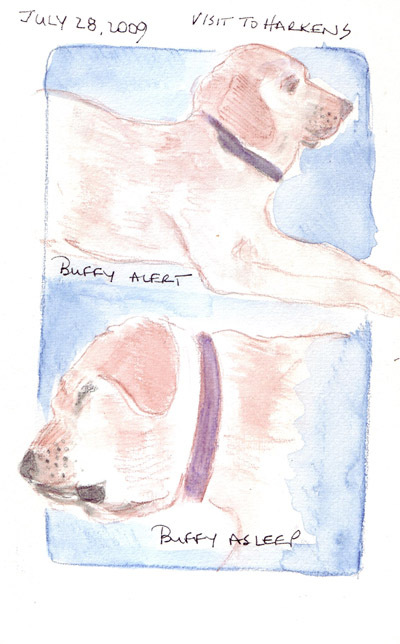 This is Buffy - awake and asleep. The rains that are plaguing us this summer began midway through our second day - making me nervous that we wouldn't be able to drive out the dirt road the next day. 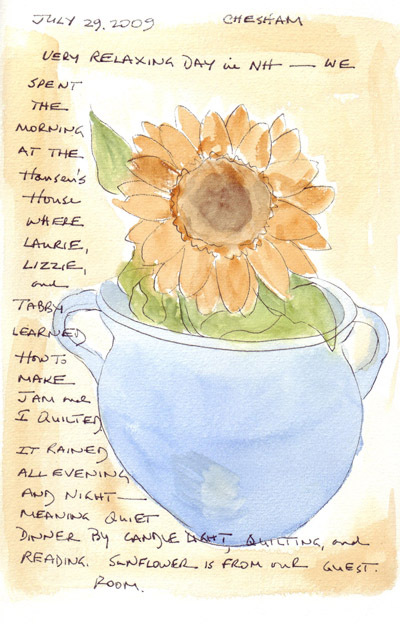 Thus my sketch was of a sunflower that was in our guest room. I am not a shopper, unless I'm in a book or fabric store. The last things I purchased were books. 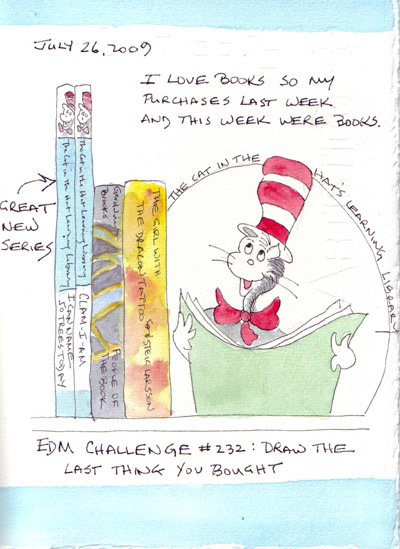 Two weeks ago I bought childrens' books from the Cat in the Hat Learning Library series: Clam-I-Am! and I Can Name 50 Trees Today for our grandchildren. This week I bought two summer books for me to read on our travels. I love coffee and enjoy my first quiet hour of each day, when I drink several mugs of filtered coffee, and plan the day. This is so important to me, that I must be able to make coffee in hotel rooms so it is ready as soon as I wake up and even before I shower and get dressed. 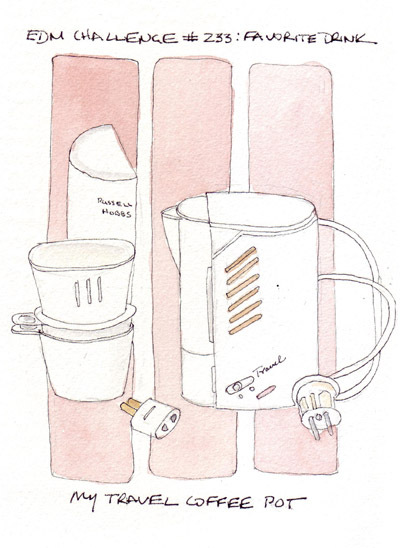 During a Christmas visit to London in 1988, I bought myself a present at Harrods - a Russell Hobbs filter travel coffee pot. I have enjoyed it on many trips since then. Our guests returned with us to New York City after "beach week" and we spent the afternoon at the Met. 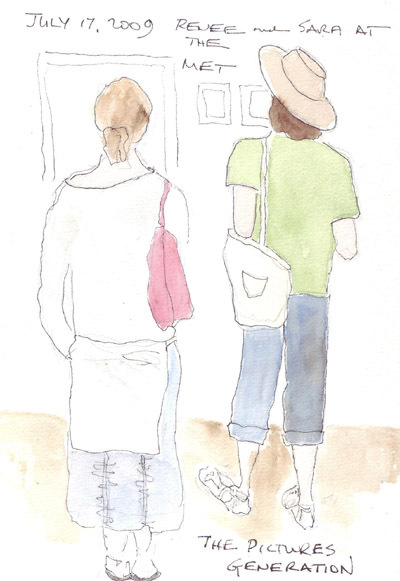 I did a quick sketch of Sara and Renee while they were looking at some of the exhibits in The Pictures Generation Exhibit. The 3 of us then went to the Model as Muse Costume Institute Exhibit while our husbands went to the Art of Afghanistan Exhibit. 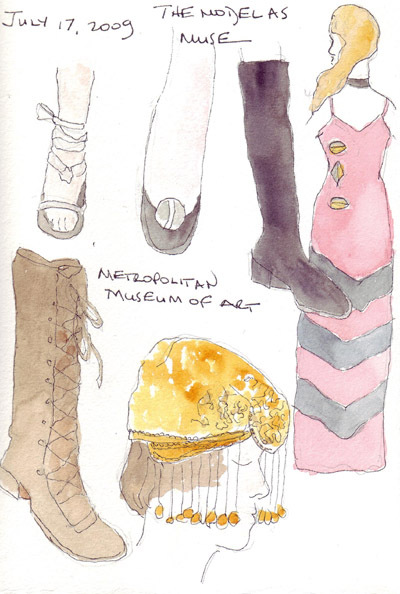 Since I've already sketched in the fashion exhibit several times, I concentrated on accessories.